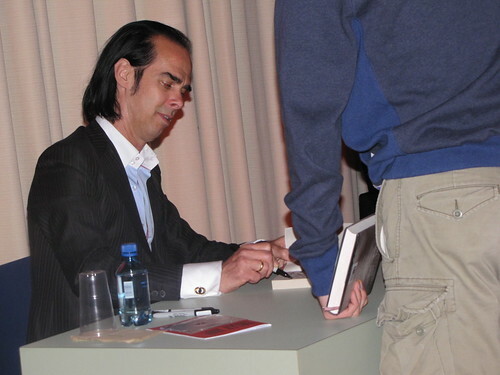 I want to write up the Nick Cave event, along with some thoughts about the novel, but there's so much to say (and I anticipate that it would be of so little interest to the majority of you) that I find myself stalling. However, in the mean time, you are welcome to look at some sketches I did - if you haven't already seen 'em via Twitter, Facebook or Flickr. I'm all over the net, me. 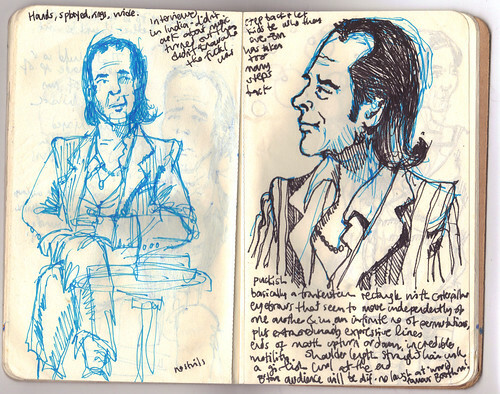 I am pleased with these, not because they are good likenesses - they really aren't, and if this had been a commission, I would have failed it - but because it is my first stab at 'life drawing' for ages and ages and I can see that I could get back to speed fairly quickly if I had half a chance. Click through to Flickr if you would like to see a bit more explanation and some notes on various parts of each drawing. 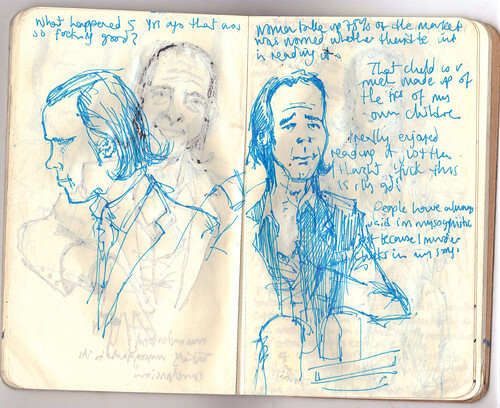 Nick Cave 'in conversation' at the Purcell Room, South Bank, 09.09.09. Photographs were unallowed (and this rule was enforced as gently and pleasantly as I've ever seen, making one wish to comply) so, shyly, I sketched from my place in the second row. 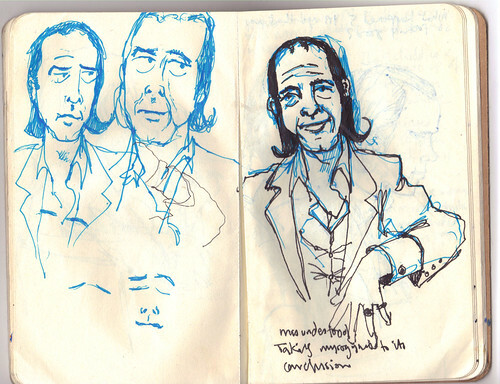 Sadly I didn't get any particularly good likenesses, but I did enjoy myself much more than if I had been snapping away. 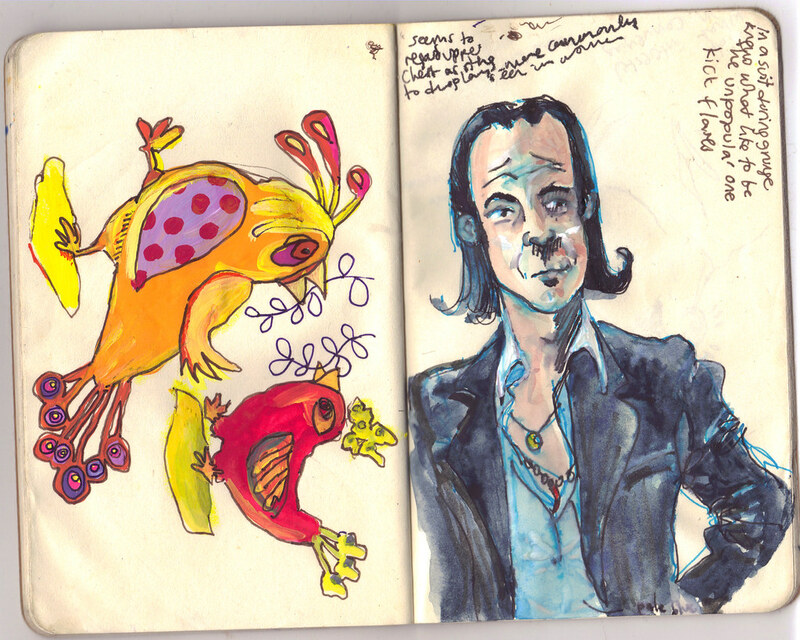 On the train on the way home I made these notes: "Puckish. [His face is] basically a Frankenstein [elongated] rectangle with catterpillar eyebrows that seem [to be able] to move independently of one another & in an infinite number of permutations, plus extraordinarily expressive lines. Ends of mouth upturn or down [as part of repertoire of his facial expressions], incredible motility. Shoulder-length straight hair with a girlish curl at the end".